To make cottage cheese, you first have to skim the milk. Let the milk sit overnight in the fridge so that the cream rises to the top. Carefully skim the cream of and keep it aside, so you can add it later when the cheese is done. You have to heat the milk a little, but because you only heat it to body temperature, none of the good stuff in the raw milk gets lost. So, heat the milk slowly to 38-40 degrees Celsius (100 F). Pour in the dissolved rennet, turn the heat off and stir thoroughly for about a minute. Put a lid on the pan and let it sit at room temperature for 4 to 5 hours. By this time you should see about half an inch of transparent liquid on top of the curd that has formed. Take a sharp knife and cut the curd in cubes of about 1 inch (2.5 cm). Put a cheese cloth in a strainer and empty the pan in the strainer (you can keep the whey if, you want, for other recipes). Place the strainer with cloth and curds in a pan or container and put in the fridge for an hour, stirring every 15 minutes to release as much liquid as possible and to get the distinct cottage cheese crumble. You don't want to squeeze the liquid out, because then you won't get the loose crumble you want, but rather a firm cheese, like paneer. Just let it drain by itself. 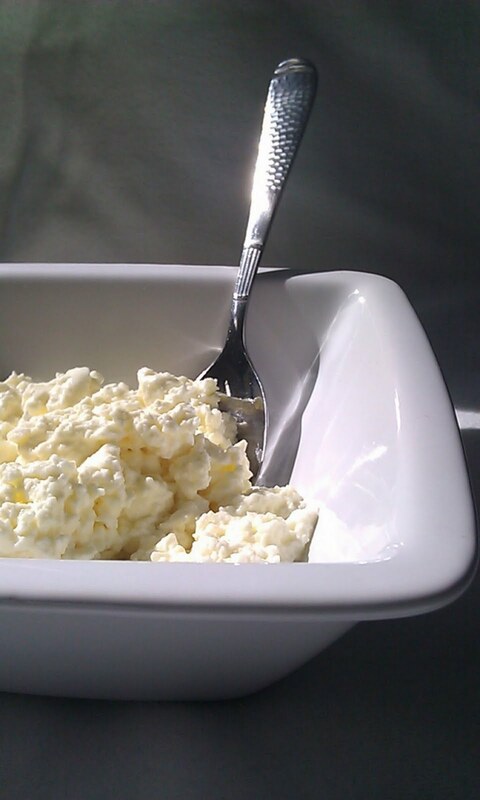 After an hour in the fridge, you put the cottage cheese in a container and stir back in a few table spoons of the cream. How much cream you put back in, is up to your own taste. You can add some salt now, but I prefer to salt it when I want to eat some. You don't need a lot of salt, since the flavor of the raw cottage cheese is unbelievable! Would it work with kekir instead of milk? I have successfully made cottage cheese many times before using low level pasteurized milk and not skimmed off the cream, so why does the cream have to be skimmed off when using raw milk? This make about 3 cups of cottage cheese.